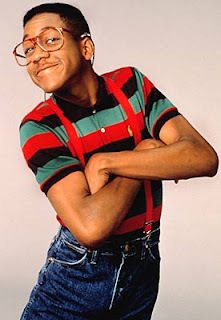 Debate: Is Steve Urkel Misunderstood? Stephen Q. Urkel is a controversial figure in America's great history. Whether he's asking Laura Winslow if she's got any cheese or pondering if he did that, he inevitably hit a nerve or a funny bone with the American masses. Some loathe his science based hijnks, while others applaud and laugh hysterically. This debate will take a deep look at Urkel and attempt to figure out which side of America's 1990s sitcom viewing audience is right. Jake: I have no love for Mr. Urkel. He's nothing more than a nerded up Kimmy Gibbler type who has a fixation on cheese and Laura Winslow. He's obnoxious. He spends most of his time getting on Carl Winslow's nerves, who has just worked a grueling shift as a Chicago police officer. He's stressed and needs to unwind. Instead he's left to deal with Steve breaking things and asking if he did it. Of course you broke that table, Steve, you just fell through it. Steve brings an unnecessary amount of chaos into Carl's life. Carl already has to deal with his own kids, his nephew and Eddie's friend Waldo Geraldo Faldo. Isn't that enough? Gary: I am going to shock you here, and say that I agree with everything you just said. Steve is annoying he is a huge burden on one of Chicago's finest--Carl, but Steve is also a tortured soul. Let me ask you a question, how often did we see Steve's parents or his house? (Maybe his basement lab now and again.) Its obvious the character comes from a broken home. I even theorize that Steve suffered from Fetal Alcohol Syndrome. Jake: I'm sure that Steve's parents did drink. If you were the parents to an obnoxious nerd like Steve you'd be sauced up, too. I agree that Steve did not get a lot of attention as a young child. It makes a kid hungry for attention, and they'll get it where ever it's available (even at a neighbor's house). In earlier episodes it is excusable. When Steve is 14 and he's still driving Carl up a wall like Dennis the Menace to Carl's Mr. Wilson, it is not all right. There's a point where being attention starved becomes inexcusable and that time is called puberty. Steve Urkel needed to grow up, but instead he stepped into a personality changing machine and became the suave Stefan. Gary: I question whether Steve's parents are alive or not in jail. Something Carl should have looked into a long time ago. Steve means well, and the fact that he has a crack addicted absent father and an alcoholic mother should have been huge red flags for Carl to inform DHS. Carl's job is to serve and protect all citizens even the ones that shrink him down on accident to the size of small rodent with a shrink ray. The fact that he felt like he had to invent something in order to become mature is a testament to this poor young kid's fragile psyche. Many times children of broken homes seek refuge in to their own imagination which one can see is not that big of leap to manifest itself into wacky inventions such as, but not limited to; a robot version of himself, shrink rays, teleports and a machine that makes people cool. Jake: While Family Matters is a fantasy series in a lot of ways (most of the reasons were just named by Gary in the above point), it has some basis in reality. The realism of the show is that there really are kids like Steve around, and they get on people's nerves. What is the right way to deal with them? I have no idea. Maybe it's to build a cool machine and turn them all cool. Maybe it's to sell them to Oscar Meyer and make bologna and hot dogs out of them. I do not think Urkel was misunderstood, just annoying. Gary: Urkel was very much misunderstood. I am not so vein to believe that I could ever think to understand someone that doesn't even understand themselves. Steve had a terrible home life and he was crying out for attention, whether it was proclaiming an irrational love for Laura at a young age or desperately trying to fit in with Eddie and his cool friends. Steve needed help and Carl and the rest of the Winslow clan turned a blind eye to his cries for help. The right way to deal with someone who gets on one's nerves is to try and help them the best one can. Not to simply scream at them or create one's own household death panel as Jake suggests. These are real kids and teens that have these problems and we must as part of a community work to help them to alleviate stress, wacky invention mishaps and crime. We can't simply tinker with their jetpacks in hopes that they will just fly to another show never to be seen again. I agree with Jake. I think Urkel was out of control during the third and fourth seasons. i would be lying if i said i understood OYIT's recent obsession with TGIF. if we've learned anything from urkel it's that if you play an annoying nerd as a young actor (see: dustin diamond, kimmy) you are forever typecast. don't do it. I AM SO GLAD THE DEBATE IS BACK! i love urkel if only for his high wasited pants - common among women/ gay male new yorkers, but rare among straight african-american men. gr8 job, guys. Why would you call the Dept of Homeland Security on an alcoholic and a drug addict? You wouldn't you would call the Department of Human Services on an alcoholic and a drug addict parent. no, I would call the DFS - Division of Family Services. well they live in Illinios so it would be the Department of Human Services. that's right! another debate won! Even though I won this debate.